Today I’m inviting ya’ll to put on your muck boots and come down to the barn with me! I’ll introduce you to Miss Mabel and walk you through my basic cow milking routine. Me getting whacked in the face with Mabel’s tail multiple times. My super high-tech milking stool. I don’t get a lot of cream unless the calf has been weaned. When I share milk or milk once a day like I am now, the cow tends to save back the hindmilk (the richest, creamiest milk) for her calf. 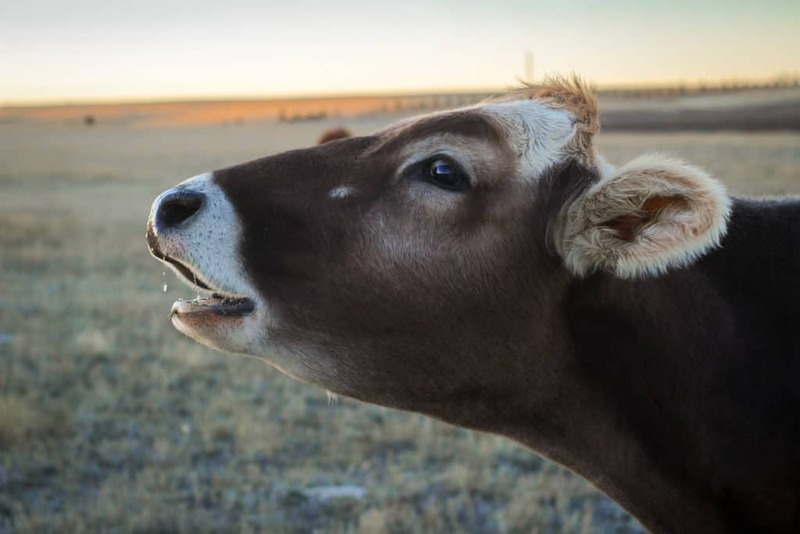 If you don’t have any calves on your cow, it is very important to milk your cow completely out— otherwise, you’ll cause her to dry up prematurely. I usually clean off the concrete pad where I milk a little more thoroughly. I was a little rushed to complete this video session before nap time was over… whoops. 20+ all-natural fly spray recipes, including my favorite! I finally bought raw milk for he first time! I’ve been trying for months and the farm is finally milking. It’s so good! I’m glad I can give my family raw milk. Thanks for all your post’s. I’m going to buy a milk cow…it’s my first! I’d love to be able to chat with you to get some questions answered! Love the video! Thank you for sharing this! I remember my mother using Bag Balm on us for rashes, etc. when my brothers and I were kids. I am curious, why did you choose a brown swiss cow? It seems like a lot of homesteader like the jersey cow. We are starting to research what type of cow we would like. We are planning to look into jersey vs. an irish dexter. Should we look into a brown swiss too? 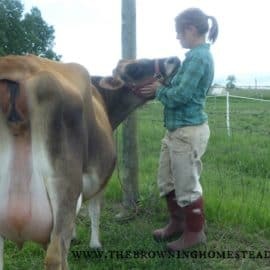 I have Brown Swiss cows, and I don’t think they get enough recognition from the homesteading crowd. Hopefully, between Jill and I we can start to change that. 😉 They are a big, hardy cow originally from the Swiss Alps, with a high butterfat percent and a quiet personality. Their calves will net you a much higher amount of beef than that of a Jersey when they’re grown. Jill mentioned in her video, that Oakley doesn’t kick very fast. Jerseys that do kick, tend to be lightning fast when they do. In general, they’ll milk more than a Jersey as well. I agree Rene! I think they are often ignored in the frenzy of praise for Jerseys. 🙂 My Oakley is such a sweetheart. And if my memory serves me correctly, I believe they are one of the oldest known milking breeds. Love this video! So cute, real, and down-to-earth. When I grew up we always used to tie the end of the cow’s tail to her leg so she couldn’t whack us in the face 🙂 Thanks for sharing your barn and milking routine and tips! Thanks Laura! Yeah, I need to tie her tail somewhere, ha! Thank you so much for this video, as well as your other videos. Very informative! Loved this! Very applicable to me since I am currently learning how to milk my cow. Thanks a bunch!!!! Great video, Jill! I love how you “keep it real”. There are so many people out there that wait for the perfect environment/equipment/etc. Like Joel Salatin once said (and I am not quoting)that don’t wait until you can do it right. Just do it and then do it again and again and again. Thanks for sharing your expertise (and quiet time/nap time). My Husband and I used to milk together one on each side. It was quite fun. We’re currently machine milking two cows but when we’re back to hand milking in a couple weeks I look forward to our little ‘dates’. (Our cows are at my Moms house up the road and she will take care of 4 y/o and 8 month old if she’s home). Take whatever dates you can get I say! I use the same “high tech” milking stool. Mine is red, though. 😉 Fun to see how someone else milks their cow. Not something we get to share and compare with people very often. hahaha! Yes– you caught my little dog reprimand! 🙂 I adore Cesar and his methods!! Great video Jill, thanks. I am qurious… Do you milk befor your kids wake up every morning or do they hang out with you in the barn? Well, I used to milk before they got up, but now they are getting up earlier and earlier! So, I usually take my 3 year old with me (she LOVES it– the highlight of her day…) and *usually* the 9 month old is still asleep. Or if he’s awake, I stick him in the stroller and pack him along. 🙂 Generally, my milking time is mass chaos, but I guess I’m used to it now, ha! Thanks, that was fun. Milking is something I’ve always wanted to try. I’d also like to see your routine of what you do with the milk after you get it in the pail. I’m also a fan of brown swiss cows – I think they are really sweet. Thanks for the video Jill. It was lovely. We hope to have our own little homestead soon so it is interesting to see how things are done. I was half way through the video when my animal loving 8 year old joined me & I had to start again. She was fascinated. She has seen the cows milked with machines at the farm where we get our milk but she loved seeing it being done by hand. She also asked me to ask what breed your dog is? I am normally good with dog breeds but I didn’t recognise your dog’s breed. Thanks Jill. I was thinking he was a mastiff x with something so I wasn’t too far off. Will look it up on the www & show her some info later. He/she is a beautiful dog. I loved the video. We are moving in a few days to NW North Dakota and finally I will be able to purchase the milk cow I have been wanting forever, so I am sure I will be watching your video again. 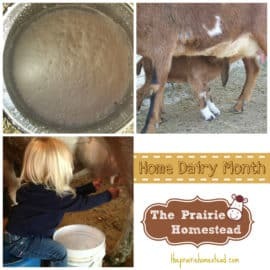 I’ve been getting raw milk for about three years now from Mennonites down the road I am hoping I can find a source once I get to ND because I can hardly stand to drink store bought milk anymore. I love your blog and I am interested in your oils too. Sometime soon I will be contacting you about the oils to get more info. Wonderful video and such a pretty girl, that Oakley! My routine is very much like yours only I just lay a fly sheet (for horses) over my girl to help with the flies, and as a bonus it has velcro straps at the back that are perfect for securing her tail. Works great for me! The fly sheet idea is brilliant!! Glad you enjoyed it Dolly! Hey, I’m new to Prairie Homestead, and I’m really enjoying it. All cows swish their tails for some reason or another, whatever season it is. If our cow gets “swishy”, we tuck her tail between her udder and her leg. This really helps to save wear and tear on my ears and eyeballs. 🙂 I am sure looking forward to reading more and more of your blog. I like that “tucking in the tail” idea! We enjoyed your video. In regards to tying her tail… I always used to get wacked. Then one day I went out to talk to my husband while he was taking a turn milking and saw him loop an end of a piece of baler twine around the tassel of our Jersey’s tail. The other end of the twine was tied to a nail on the barn wall. It works! For the record, he was raise don the farm and I grew up in the city. However, your walls are concrete, but if you positioned her with her tail near a wooden partition? I am wondering, about how long does it take you to milk one cow? Are you able to still leave for the weekend if you wanted to ? Thanks so much for this very informative video. 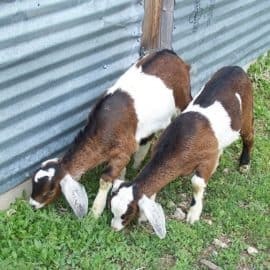 I am just starting my homestead and as of yet do not have my milk cow. I have a belted galloway that i would love to try to milk but unfortunately I think she may be too wild. I have been looking at brown swiss cows for my milker but have not decided yet what breed to get. Anyways thank you Jill for the video and I look forward to more to come. Hi Jill, found your web a few weeks ago. My husband an I love Jesus also. We live on a farm in Ct.but we are retired. Hebeing 67 and I’m 63. I milked our cow on the farm I grew up on till I was 18. Then I got married and here I am 45 yrs later, but we have beef cows only. One of my neighbors said if we got a cow she would help with milking, ah tempting for sure! I am making my bet own vanilla b/c of you, and bought a pressure canned. Which I haven’t tried out yet. So far I’ve done water bath, zinc relish,salsa,catsup,wild grape jelly,applesauce,transmitter pickles, and a friend came over before I got my pressure canned and we did beef stew. Looking forward to making my own tomatoe sauce with meat an canning it. Well God bless you Jill and than you for the memories, I just love cows so much. LOVE that dog – made me quite homesick. I used to have a boerboel when I lived in South Africa. Hi Jill, Really like the video! Two questions I have are- will you be milking 2 times a day when the calf is weaned? And how much milk do you get when calf is on her vs. calf not on? Thanks! Yes, we’ve been milking 2x per day since we weaned. I get about 2 gallons per milking when there is no calf, and only about 1 gallon per milking when the calf is on her. why you don’t use milking machine? Do you separate mom and calf at night? And if I don’t have a concrete pad to milk on what would you recommend ? You could certainly see your skills inn tthe article you write. Jill!! I cannot tell you how excited I am to find your blog. I am a mama of five and we live on a acreage in Nebraska. Three of my kids are adopted from Ethiopia and they are used to raw milk. I for the first time bought raw milk from a local farmer this week. The kids loved it. We also just ordered our first chicks. This is all new to me yet I am so excited to learn and teach my kids to do it all right along with me. I homeschool all of them at this point. I cannot wait to learn from you and read all over this blog. Thank you!! How awesome Jen! I’m glad you found me too. 🙂 You are almost a “neighbor”– NE isn’t too far away. Oh Jill, I loved this video ! Sure! It might take a bit of work to get her used to it, but it can be done. how much milk to you get with hand milking and how long does it take to get it? Im new to Dairy cows and getting a babe in a couple of days. What is the dip for the teats used for? To kill bateria? I’ve read elsewhere some people do it before and after milking. When you wipe down the udder do you wipe down the teats as well? A milk cow has finally become available in my area! I have tons of questions! A lot got answered in your guest post where she says how much milk to take. If you go away, can you leave the calf on her the whole time without any consequences to her or the calf? Or should she be milked like normal? Also, how many months do you allow your cow to dry up for? How do you allow her to dry up without creating problems?